The British Gazette » The present is a foreign country – They do things differently now. As well as being (this year) Ash Wednesday, the 5th March is (every year) St. Piran’s Day – Cornwall’s Patron Saint. St. Piran is a little known saint outside Cornwall whose life and times is mostly mythical and apocryphal. 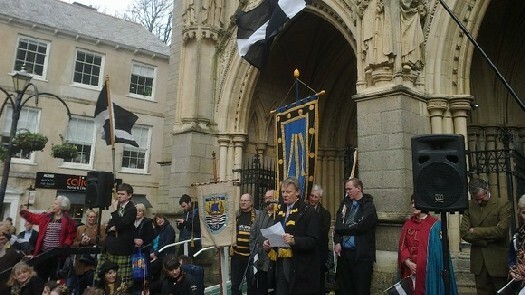 My decision to attend the ceremony in Truro was motivated by the fact that a woman holding the office of Grand Bard of Cornwall was to make a speech at High Cross in Truro – outside the cathedral. Along with the Lord Lieutenant and the Lord Mayor. My grandfather took his family away from Cornwall in 1916 (to Devon) and my father ended up (with his brother) in the West Riding of Yorkshire in the 1950s. Recent events have caused me to relocate to Cornwall thus ending a period of 98 years when a Rogers (from my line) was not resident in Cornwall. My own judgment however is much less censorious than that. Although I did not share the open display of Cornish nationalism present at the ceremony – which was displayed on this occasion most assertively – I have sympathy for those who express it and understand why. The winter and early spring before the first of the tourists arrive is a good time to come to an understanding as to why these good people feel the way they do and express themselves so. Go to a village like the much bestormed Porthleven (near Helston) and witness the number of flats and houses empty and let out as holiday lets. Here is a figure that will shock you: Four fifths of Cornish property is bought by outsiders (many from the Home Counties) making it difficult to the locals to make a life there. There are Cornish nationalists who are campaigning for an elected assembly. Such an assembly would NOT be able to make much improvement in the situation. Neither would the radical desire for independence. Cornwall’s problems stem from her economic underdevelopment. Cornwall is regarded by Westminster as a tourist destination. This most clearly demonstrated by the present incumbent of Number 10. The simple fact of the matter however is that were this formerly sovereign state was run by a government of competent patriots and not incompetent traitors the county of Cornwall could and would prosper. Why? Minerals. As readers know, Cornwall produced tin and copper. Production costs however forced closure. Many of these mines however are full of thorium. There is enough thorium in the county to power the UK indefinitely. But then, delusional idiots such as Ed Davy ignore this fact and content themselves with their fantasy projects of powering the UK’s national grid from wind turbines in the middle of the North Sea!